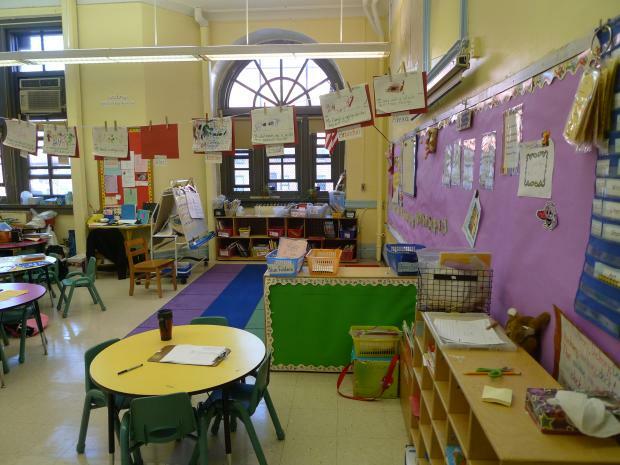 PARK SLOPE — The halls of P.S. 124 rang with cheers when officials found out in April that the school's grungy bathrooms would be getting a long-overdue $150,000 renovation — but since then there's been silence. Principal Annabell Martinez said she's still waiting for a phone call, email or letter — any word — on when the sorely needed rehab will begin. "I expected to get some kind of contact during the summer months [saying] it was in bidding," she said. "But I've actually heard nothing at all regarding this project." 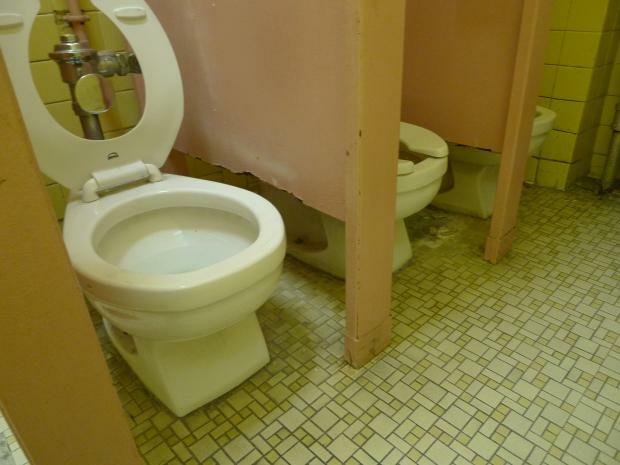 While the school waits, kindergarten and first grade girls are forced to make do with a dingy bathroom where the stalls don't have doors and the tile floor is crumbling. One stall has a radiator sitting just inches from the toilet. In the winter, children can't use it because the heater could burn them, so only two stalls are usable for several months out of the school year. "I don't know who the genius was that thought this was a good idea, but it certainly does not respect children," Martinez said as she looked at the stalls, which are so narrow and awkwardly constructed that some kids have gotten their legs stuck between the toilet and the wall. Because there's no privacy in the doorless stalls, students must go to the bathroom in groups at scheduled times — a process called "bathroomizing," the principal said. While a teacher stands watch outside, girls go inside in pairs. In the poorly lit boys' bathroom, there's only one stall — not nearly enough for her students, Martinez said. Five-year-olds can barely reach the heavy flushing mechanisms perched high above the two adult-sized urinals, and in the winter there's no heat in the boys' bathroom, she explained. "It makes me angry, it really does," Martinez said. "I understand the red tape with the Department of Education, I really do. And I also know that there are other schools who have needs that far exceed this little building. But this has been going on for far too long." Martinez, who's been principal at the pre-K-5 P.S. 124 for eight years, has tried repeatedly to get the Department of Education to fix things. But the 22-year veteran is well aware that her small school, with about 315 students, is just one of many in need of upgrades. When City Councilman Brad Lander announced his participatory budgeting program in September 2011, Martinez jumped at the chance to finally solve the problem. The budgeting method allowed residents of Lander's district to decide how to spend roughly $1 million in taxpayer dollars on neighborhood improvements. At a series of public meetings, locals came up with a wish list of possible projects — from repaving parts of 50th Street to building a Bangladeshi-themed monument at Kensington's Dome Playground. Residents voted on the projects, and the top seven vote winners received funding. Martinez banded together with parents and teachers, mounting an aggressive campaign to make sure P.S. 124's bathroom renovations made the funding list. Parents even handed out fliers on Fifth Avenue to encourage neighbors to vote for the renovations. The effort worked. Of the 20 possible projects in District 39, renovating the rundown P.S. 124 bathrooms won by a landslide, garnering 958 votes out of 2,213. The school community was thrilled when they got the news, and elated parents called to say, "I heard we won!" Now that almost six months have passed, that joy is starting to wither. "I'm sort of getting that feeling again like we're being forgotten a little bit," Martinez said. "I don’t want that to happen." A spokeswoman for the Department of Education said the renovation project "will be assigned to a consultant to begin scope and design shortly," but noted it was premature to give a ballpark completion date. Lander said his office checked to make sure the project was on this year's budget list for the School Construction Authority — the agency that will do the renovation work — but he hasn't heard from the SCA about a possible timeline. He noted that capital improvements can sometimes take years to complete, even when they're fully funded. "One real upside of participatory budgeting is that constituents learn about and grapple with the sometimes maddening realities of getting projects done in New York City," Lander said. "Hopefully over time more people, having grappled with them, will help us make the system work better." This year's round of participatory budgeting for City Councilman Brad Lander's District 39 kicks off Monday Sept. 24 with a public meeting at 6:30 p.m. at the Carroll Gardens Public Library, 396 Clinton St. The Park Slope meeting is scheduled for Oct. 3 at 6:30 p.m. at Greenwood Baptist Church, 461 Sixth St.